The University of Florida site has production guidelines and information on height control, post production, growth regulators, and disorders. The Texas A & M site has a broad range of excellent production information. Louisiana State University offers production guidelines for the Gulf South. North Carolina State University has posted pour-thru guidelines to help you monitor the substrate. Have a poinsettia problem? 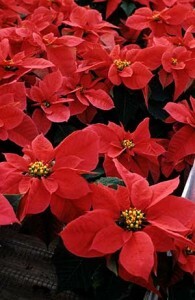 North Carolina State University has posted a poinsettia diagnostic key to help you determine the cause.